I had the pleasure of visiting Jonathan and Kate Mess's studio, tucked in the woods off a quiet road. 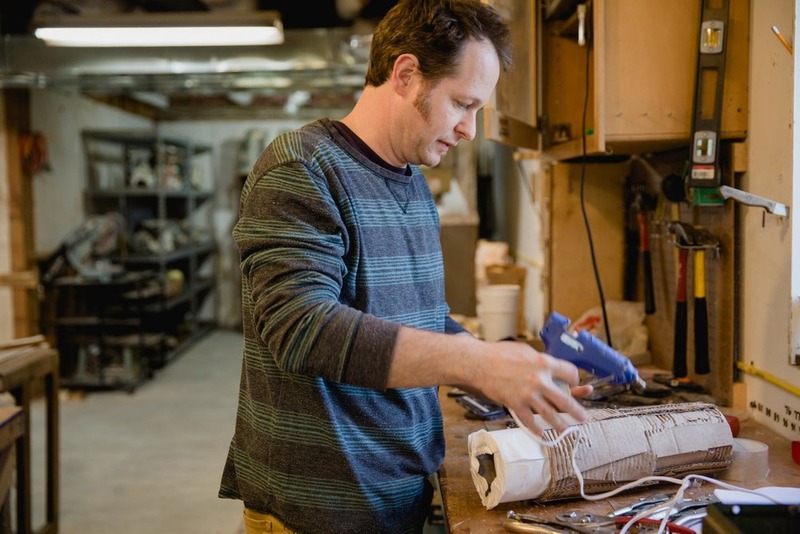 They both share a space for creating in the daylight basement of their house, which allows them easy access to outdoors for a lot of Jonathan's use of the saw for his work. Their sweet little daughter was happily running back and forth between the two work spaces. He recently received a grant to create a small gallery in their studio for showing his work, which they had just finished. So while he worked and I photographed, we listened to mixed tapes from decades ago and I got to see just how he makes his famous sculptures. To learn more about Jonathan's work, please read the Q&A! Also, Kate's studio tour coming soon! I try not to buy clay and glaze for my work anymore. There is so much waste from industry, schools, art centers, etc. to keep me busy. Ceramic artists are not allowed to toss ceramic materials into a dumpster because it can leach heavy minerals and metals into the environment. I collect ceramic refuse, waste and seconds to reclaim and make new work. “Reclaim” is a word we use in ceramics; we can reuse clay over and over by drying it out, breaking it up with a hammer, and adding water back into it. This creates a slurry that you dry to the desired moisture level and use again.. and repeat. This is obviously a lot of work, so many people choose to toss it aside and buy new, ready-to-go clay... But, I find it very satisfying to take materials that people consider valueless and transform them into something valuable again. There’s a little bit of magic and metaphor in it. Can you describe a typical afternoon in the studio? It depends where I’m at in my process and what time of year it is. In the beginning, I gather materials, prepare them, test them, and organize them by color, melt, and grain size, so to speak. Then, I create my exterior forms out of cardboard boxes. I pour, sift, layer, toss and build up material into the boxes. I try to add variety of color, particle size, and think about the composition inside, on top, and as a cross section. This takes time and patience, as too much wet material can cause the boxes to open up and spill— which can be interesting, but usually its no good. I do this over and over for weeks. Much depends on where I am working and the weather. Wet, humid summers don’t help clay to dry. So, I wait... patiently… for months. Once the boxes are filled up and dry, I can peal off the cardboard to see some of the exterior. More drying, then I slowly fire them. Once they are fired, I cut them with diamond wet saws and re-fire to bring out the color. Then I clean them up, and prepare them to show. What has been the biggest challenge so far in your work? It is very physical work. I enjoy this tremendously, but I am not twenty years old anymore. So, I have started hiring a helper on the serious lifting, moving, and mixing days. As a Maine artist, how do you feel living here has influenced your work? I live here as a choice. I love Maine and its natural beauty endlessly. I could not live anywhere else. The extremes in weather, mountains, rivers, tides, seasons, regions, and people are simply awesome. This has obviously come out in my work as abstract landscapes. I also feel like my working style is to tune in with the seasons. Much of the year is spent indoors, finishing, photographing, and working, but when spring, summer and fall are here, I want to work and be outdoors as much as possible. When you are not working with ceramics, what are you doing? Well, I teach high school art— that’s a big chunk of my life. When teaching is under control for the day, I spend time with my beautiful wife and daughter. We like good food, good people, and good times. I fish fresh- and saltwater for anything that will bite and fight. We have a productive garden, and we spend time with family and friends from here and away. I love to explore this great state and region by land and water. If there is an adventure happening, I want in. It helps to have a partner who not only understands my process, but helps me work through it. Without her, I wouldn’t be where I am. Balancing work, family, and a passion career is hard. When I am at my best, I am well-fed and rested, I am tuned in with the seasons, and I am realistic about what can and needs to happen before and after the snow flies. I allow my life to be part of the cycle. I work hard for big chunks of time and I take big chunks of time off and enjoy the good things. I can put my head down and pull all-nighters if necessary, but I have learned to say no to things that are are not realistic or helpful. My hands, seriously. I really don’t use many tools to make my work. I work really primitively. I show up with a knife and some buckets and will make do with whatever is available. I like the challenge of this makeshift style of making. I could also say a power drill… Or my truck, or my brain, or my entire body, which is connected to my hands. But hands it is, with gloves on them when necessary. If you had the choice between going back in time or visiting the future, which would you choose? I hope in the same place, just with more time to play.